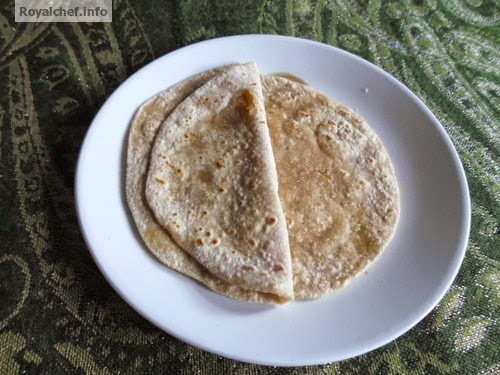 This is a step-by-step Recipe for making at home sweet and delicious Sweet Sheera Stuffed Chapati (गोड सांज्याची पोळी ) or Sheera Ki Chapati. This dish is very popular in Maharashtra and is prepared specially on festivals and religious occasions. The Sheera Ki Chapati can also be served for breakfast or in the tiffin boxes of school going children. 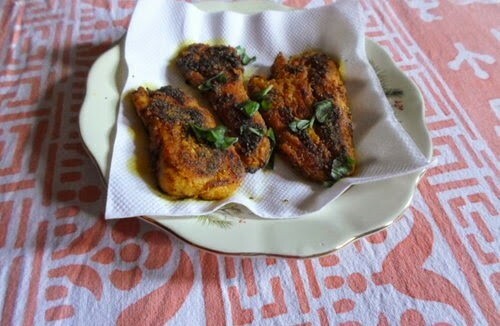 Heat the Ghee in a Pan and add Suji and then fry till color changes in to light brown. Add the boiled Milk and water and cook for two-three minutes on a slow flame. Then add the Sugar and Cardamom Powder, mix it well and cook for five minutes on a slow flame. Keep the Suji Sheera aside for cooling. In a plate add the Refined Flour, Wheat Atta, Salt and hot Oil and mix it well then add Milk to prepare a thick Dough and keep it aside for thirty minutes. Prepare small size balls from the Dough and roll the Dough ball in a Puri size shapes, then insert a table spoon Suji Sheera and close the Puri tightly and roll it again like a Chapatti. Heat the Tawa and roast the Sweet Chapatti on the both sides till it become crispy. Serve hot by adding Ghee. कृती : कढई मध्ये तूप गरम करून रवा गुलाबी रंगावर भाजून घेवून त्यामध्ये गरम दुध व पाणी घालून दोन-तीन मिनिट शिजवून घ्या. नंतर त्यामध्ये साखर व वेलची पावडर घालून मिक्स करून पाच मिनिट मंद विस्तवावर शिजवून घ्या. सांजा थंड करायला ठेवा. एका परातीत मैदा, गव्हाचे पीठ, गरम तेल व मीठ घालून मिक्स करून दुध वापरून घट्ट पीठ माळून घ्या व अर्धा तास बाजूला ठेवा. नंतर त्याचे छोटे गोळे बनवा. पिठाचा एक एक गोळा पुरी सारखा लाटून त्यामध्ये १ टे स्पून सांजा भरून पुरी बंद करून त्याची चपाती लाटा. तवा गरम करून सांज्याची चपाती दोनी बाजूनी खमंग भाजून घ्या. गरम गरम चपाती वर तूप घालून सर्व्ह करा.